The early protagonists of The Twilight Zone were all trying to get back to something. An Air Force man tries to return to civilization. A peddler haggles for his life. An addled gunslinger and a faded starlet grasp at former glories. Even the Rod Serling-penned episode of Westinghouse Desilu Playhouse that set CBS’ course for The Twilight Zone contained traces of this tendency: In “The Time Element,” William Bendix plays a man suffering from a recurring nightmare in which he attempts to warn the people stationed at Pearl Harbor of an imminent attack from Japan. 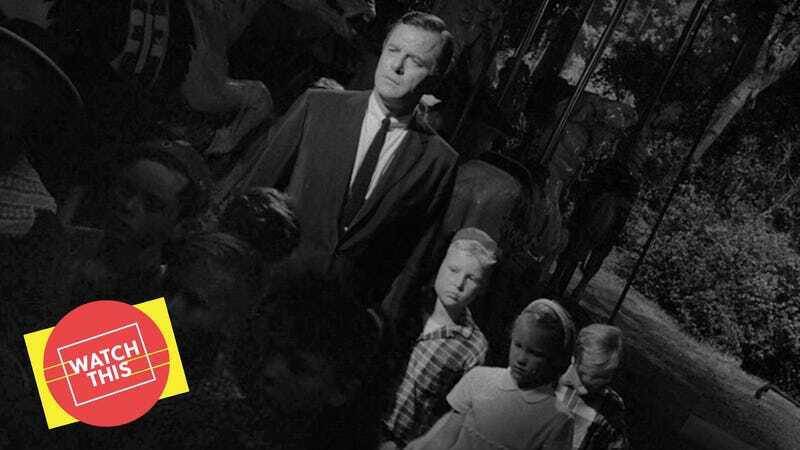 Martin Sloan, skinny-tied man in the black flannel suit at the center of The Twilight Zone’s fifth episode, “Walking Distance,” isn’t just trying to get back. He’s racing there, introduced behind the wheel of a speeding automobile and eventually running through the streets of his hometown on foot. Actor Gig Young was pushing 46 when he played the 36-year-old advertising executive, the decade between them all the better to convey the toll Sloan’s fast-paced life has taken. He longs for simpler times, for summers of chocolate sodas, baseball diamonds, and carousel rides. He wants an escape. He finds Homewood. The time warp he trips after hoofing it from the service station reveals itself slowly, though I do have to question whether the time that’s passed between “Walking Distance”’s 1959 debut and 2018 has rendered some of the initial clues illegible. (Should we recognize the syrup dispenser the soda jerk inspects as curiously old-fangled?) Not that it matters: By the time of the act break and that telling Bernard Herrmann harp glissando, it should be evident that Martin Sloan is performing an act greater than longing. He’s projected into his own past, encountering his 11-year-old self at the very ride where their fates will become further, irreversibly enmeshed. In a far-off depiction of days that were only a few months in “Walking Distance”’s future, a Korean war veteran who could’ve been Martin Sloan’s contemporary likens a carousel to a time machine. He, like Serling, knows that nostalgia is powerful and fragile. What he doesn’t mention is that if you spend too much time trying to go back on the carousel, you’re liable to wind up hobbled. Availability: “Walking Distance” is streaming on Netflix, Hulu, and Amazon, along with the remainder of The Twilight Zone, and is available for purchase on iTunes. It can also be obtained on Blu-ray or DVD from Amazon (which helps support The A.V. Club) or possibly your local video store/library.